Do you like Web sites about gladiators? -- Then you'll really like this site. How we promote online today...will echo for eternity. I don't know what that means either, but free traffic is certainly cool. Dan Davis has really outdone himself. I mean, a traffic exchange about gladiators? This monkey sure loved "Expelled" -- I saw "Expelled: No Intelligence Allowed" the other day, and I am one monkey who had a really good time. It's available on DVD right now. If the intelligent design/Darwinism debate is something you're interested in, this is a film you shouldn't miss. Keep standing up for the cause, Mr. Stein. 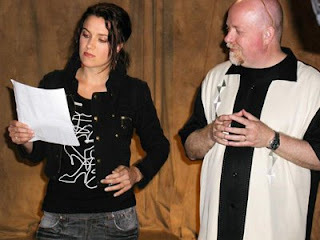 It must have got lost in the mail -- My friend Rebecca St. James is currently working on a new film with Stephen Baldwin, and I didn't receive a script. I guess I'll just keep coasting. Rebecca, I can't wait to see you and "Ted" when this one comes out next year. Let's all plan on seeing "To The Wall." I'm sure I'll remind us again as opening night arrives. "But if we hope for what we do not see, we eagerly wait for it with perseverance" (Romans 8:25). 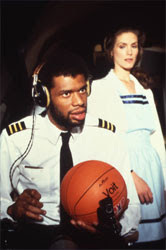 First off, let me thank NBA Hall of Famer Kareem Abdul-Jabbar for giving me the idea for this blog post. Like Kareem explains to Andrew Bynum of the Los Angeles Lakers, sometimes we have to persevere. It takes some patience. It may even take longer than a week. You see, we're all waiting on something in life, aren't we? We're waiting for the economy to get better. We're waiting for the Texans to win a road game. We're waiting for our business to take off. We're waiting, like Andrew Bynum, for the right opportunities. We're waiting for our Princess. We're waiting for John to post something new on his blog. And we're all waiting on God. Rest! Everyone waits. The Apostle Paul and Kareem seem to have it figured out -- we've got to have some patience along with our perseverance. We've got to work through it when it seems like nothing is happening. Just remember, we're cooking chili. And chili apparently takes a long time to cook. But chili tastes good when it's finished. I like chili. It's been said, God is often working in our life the most when we see it the least. Knowing that, maybe you feel like he must be working overtime right now. You might say, "But you've got to do something, John. You can't just sit there. You went a couple weeks without posting anything online." Waiting is doing something, my friend. There are times in life, and situations in life, in which the best thing to do is wait patiently (Lamentations 3:26). After you've done all to stand, you've gotta just keep standing. The good thing is, there are also some things in life we don't have to pray about. I don't have to pray about whether to breathe or not. I don't have to pray about going to the bathroom. And I don't have to pray about waiting. You know why? Read the scripture at the top of this post. I don't have to pray about scriptures in the Bible. I like that. I wonder if you are struggling with something today you feel isn't happening fast enough? Let's be patient and let God do what he wants to do in our lives. "Consider it pure joy, my brothers, whenever you face trials of many kinds, because you know that the testing of your faith develops perseverance. Perseverance must finish its work so that you may be mature and complete, not lacking anything" (James 1: 2-4). First off, let me thank Sunny Suggs of the world-famous BootScootinTraffic.com for giving me the idea for today's blog post. I don't want to lack anything. Either should you. That's why we look into God's word frequently on this blog, because we know that what we see everywhere around us is temporary and subject to change, but the words in that book...well, you know. Consider it pure joy, the Apostle Paul writes. That means we should replace moments of discouragement or testing with the joy of knowing God is in control and he will get his way in the end. I like that. We don't have anything left to worry about, because we rest in his arms like a baby and he takes care of our every need. I saw Plumb singing that song last night on the television machine, and I said "Amen." You know why so many Christians are unhappy? Because they are stressed out and worried, doing all sorts of things God never told them to do. People pleasing. Kissing the feet of the people who kick us. You can rest assured, like the song says, I won't be kissing the feet of anyone who wants to kick me. Neither should you. You can be anything that you want to. Persevere silly! One of the other things we do that God never asked us to do is listen to the negative, accusing voices around us. You're not good enough. You blew it. God can't use you. He's not going to turn your situation around. Your life is swirling around like a turd in a toilet. Your house is on fire. You're going to have to ride a bicycle to your dead-end job in a cubicle when this is all over. These are the devil's messages, and I tune out the devil's messages like I tune out a two-dollar radio. And so should you. God's got a fantastic job for you and me. We're going to live in a beautiful home we can be proud of. We're going to see all our dreams fulfilled and we are even going to touch the world in major motion pictures. We're going to write books, too. We're good enough, We're smart enough. We're talented enough. We're attractive enough. And gosh darn it, people like us. However, let me point out, that even if someone doesn't happen to like us, it doesn't matter. You know why? You and I are a friend of God. It's in the Bible, and its in a pretty song, too. In times of trial and testing, who are you going to believe? Jesus. That is the correct answer. Perseverance. It really is a choice that we must make every day. If you're having a difficult time being consistent in that decision, can I ask you a personal question? Are you spending the time you should in his word? Are you starting every day off getting quiet for a few minutes, concentrating on what his words say, or are you just getting on some goofy Internet Web site and believing what the unregenerated minds of this world would have you believe? Thank the Lord, you are a person of faith. Thank the Lord, you have made the choice, with me, and you will persevere in whatever God has led you to today. No matter where you are in life, or what you are facing, God has the answers and has already plotted out your victory. It truly is a great day for America, with the election of Barack Obama as our next president. The day we elected an African-American to the highest office in the land needed to come soon in this country. Beyond the history of this moment and healing I hope it brings our nation, it also puts a man I believe to be a class-act, with a true love for this country, in office. No matter who you voted for or what your political views are, the historical significance and what this means for the promise of America for all its citizens cannot be denied. Hopefully this is a major stepping stone into a future where racial issues won't be a consideration like they have been in our past. This election is one giant leap into that better America where one can truly be judged by the content of his or her character, and not the color of their skin. Character, and that hope of an America better than the one we inherited, is why he was elected president yesterday. I certainly don't mean to take anything from John McCain, a true American hero, who I believe would have made a great president as well. The fact is, Barack Obama represents a change in America that was a long time in coming -- and it's time has come. I'm happy today that President elect Obama has been given the opportunity to bring his vision for America to the world. He deserves our support and upmost respect. Godspeed, Mr. President. Our prayers are with you and your family. Please keep searching. Maybe I'm Angelina Jolie's missing son -- Changeling is a very good film, minus the misuses of our Lord's name. I saw it Friday night. We should encourage Mr. Clint Eastwood, not only a fabulous director but a leader as well, to try his hand at a remake of the Academy Award winner for best picture in 1934. That would be another great movie. Good job, sir. I want to compliment you. This film and Jolie's performance are Oscar-worthy. That's very thoughtful. They're not raising ticket prices -- The Houston Astros are being very considerate in this tough economy, and keeping ticket prices at the same level next year as last season. I had thoughts about a better plan: Raise the ticket prices, and get the Astros into the playoffs. Go vote! Free coffee! -- Starbucks will give you a free cup of coffee on Nov. 4 if you vote. Thank you, Starbucks. Our world is better because you're in it. This new commercial might be divinely inspired. We're going to start a new, reoccurring series here on the blog entitled, "Man, you need Jesus." From time to time, I'm sure you've heard someone say something, or read something somewhere, and thought to yourself, "Man, you need Jesus." I have, too. I'm going to occasionally share with you who I think needs Jesus. Now, please don't take this the wrong way if you appear here. The truth is, we all need Jesus. But consider it a badge of honor...then get right with God. Please take a look at Richard Justice's blog entry from today, featuring his thoughts on what the Houston Astros can learn from the two World Series teams this year, the Rays and the Phillies. Richard is a sports writer for the Houston Chronicle. A very thoughtful, well-written blog post. Scroll down, however, to the comments. You'll find one long response of his in italics, responding to a comment made by "will." What happened here, Mr. Calm, Cool and Collected? I'm not sure how Barack Obama, Fox News, the Washington Times and Sean Hannity got tied in with the Phillies draft picks. And that's not a nice word you called Mr. Hannity. That's not the kind respect for others our future president asks us to have. I believe in Jon Heyman, he's part of America and I believe in America. I believe in Sean Hannity, he's an American with feelings and deserves better than this. I believe in you, too, Richard, but I've got the facts: You need Jesus. As of 11:42 p.m. today, this blog has received 690 unique visitors. See how easy that is. We can continue to get the word out about the exciting things happening here in the U.S. But we have to work together to make it happen. "The Lord will perfect that which concerns me..." (Psalm 138:8a). Has the Lord started something in your life? I'd count on him finishing it. Just read the scripture above. If you don't remember anything else I've said today, remember those words. They're the words of the Living God, and they never come back void. Defying the advice of a knowledgeable taxi driver and a rapper who once declared that Inglewood is always up to no good, I stayed in Inglewood my last few nights in Los Angeles. Turns out, Inglewood was up to much good. Providing me with a cheap motel qualifies as very good. And, I got to rub shoulders with lots of interesting people. If you're ever looking for a great time, take the 117 bus east through Inglewood. Then, transfer on Central heading toward downtown. You might not find this bus route touted on any Los Angeles travel brochures, but you'll enjoy the pleasant drive and it only costs a total of $2.50. You can't beat that. I made room for an elderly woman to sit next to me on one bus trip, because that's what kind young men do on the bus. She didn't speak English (at least she didn't speak it to me), but she often put her Big Lots sale brochure from the newspaper in front of me, pointing out excellent products she apparently felt I needed to know about. One was a lock-box of some sort. It looked like a box you would store important papers or documents in. The other was a very inexpensive package of t-shirts. She would put the paper nearly in my lap, point at the product and say something to me I couldn't understand. I would just smile at her and those seated around us say something like, "That's an excellent price for that," or "I've gotta get over there and get me one of those." I also met this really cool guy at the bus stop on West Century Avenue one day. We got to talking about Los Angeles. He told how after he got out of prison he knew he couldn't go back to San Diego, because he was getting in too much trouble there, so Los Angeles seemed like a great place to start over, since that's where he was born. He'd found a good job there in L.A., and things were going well for him. I told him I was from Texas, and he said he liked Texas okay but shared how "Chicanos from California don't really get along with Chicanos from Texas." I wanted to ask him how Chicanos from California felt about Caucasians from Texas, but the conversation was going so well I didn't really want to go there. When he told me about the tension between Chicanos in different parts of the country, I asked him, "Can't we all just get along?" He apparently thought that was pretty funny, letting out a little chuckle. I was thinking, "Why wouldn't the Chicanos from California and Chicanos from Texas get along?" They should unite. That's a lot of Chicanos. Politically they could pretty much do whatever they wanted to do if they put away their differences and banded together. I took the bus through Inglewood, then transferred and went over to to Hollywood Boulevard also. I bought a t-shirt that says "Los Angeles, California" on it, which I wore proudly on my Greyhound trip back to Texas. Hollywood Boulevard is a place everyone needs to see at least once in their lifetime. I like to go there every time I'm in Los Angeles. There are lots of tourists there. A nice lady asked me twice on the street if I'd like to take a tour of Hollywood that included movie stars homes, but that seemed a bit strange to me so I turned her down. Frankly, I'd be embarrassed to admit I'd taken part in something like that even if I had. Can you imagine someone paying money to drive out in front of your house and gawk at it? I really wanted to talk to this guy. A man stood at the corner of Hollywood and Highland with a huge sign that read, "Believe Jesus. Be ready." I was working my way over to talk with him and let him know I did believe Jesus and I was already ready, when the return bus came down Hollywood so I never got a chance to speak with him. The economy is doing pretty well in Hollywood. The line for the Beverly Hills Chihuahua was practically out onto Hollywood Blvd. To people in the movie business, cutting back means switching from a latte to drip coffee, probably. Yeah, I read David Carr's article in the New York Times about L.A. following its own script...that was pretty well-written. David, you think flying out of Newark is interesting? Take the Greyhound. Trust me on this one. I enjoy L.A. and never like to leave once I'm there. It's rather strange, actually, because only a few years ago, I never would have considered L.A. as a possible place to settle down someday. But for whatever reason, my attitudes toward the city have changed. I find it exciting, exhilarating. In just a couple of years, I've encountered a complete turnaround in my mind. Is that the Lord? The Word teaches that if we delight ourselves in the Lord, he will give us the desires of our heart. One of the things I find myself praying often lately is "Lord, please make your desires for my life my desires." In other words, I want to always make sure the things that feel exciting to me, or the things that are motivating me, are desires put there by him. In the end, I want what he wants for me. I know there's no other way to feel truly fulfilled. If L.A. isn't the eventual place, I pray he changes what I currently feel inside of me. I arrived back in Houston early yesterday morning and thought you might like to hear about some of the highlights of another wonderful visit out west. Until next time, goodbye L.A. Hope to see you again soon! I'm writing to you from the great city of L.A.
Super 8 Motels, another fantastic contribution to American life, offers free coffee with a night's stay. And it's good coffee. I'm lit up like a Christmas tree trying to decide what I'm going to do today. Super 8 is great, but other places are cheaper, so I'm moving on tomorrow I think. There's some places down the road that are less expensive, but the nicest taxi driver in the world I met at the L.A. bus station told me some places to avoid. I might be drawn in by the power of a $39.95 place to sleep, but they may not be as safe. I think I'm going to need to balance my life in the very near future between cheap and safe. We need to make food that is good for you less expensive. If you eat cheap, you don't eat well, in general. I don't want to eat garbage because then I'll look ugly and out of shape and apparently as fantastic as this city is, many here put a premium on how someone looks. If you even have a bad haircut here, they'll pick on you. Before I start eating well, I do need to catch an In and Out Burger, of course. Those things are incredible. I already did the Del Taco thing yesterday. Some fellow Texans who hadn't been to California in a while ran off the bus and into that place like it was Cafe Annie yesterday because they'd been waiting so long to put one of those burritos in their mouth. Out of respect for my arrival here, I put on a tie and some slacks today. I may even wear a jacket for a while. I don't know if I needed to, but when you're unemployed and down to your last dollars it just feels good not to wear the pair of shorts and sandals you wore on the bus for days. I'll pretend I have a job today. Today, my job is to post something on the Internet. Someone told me once that you shouldn't dress for the job you have, you should dress for the job you want. If I dressed for the job I had, I'd be in my skivies and a pair of shower shoes, so today I'll wear something else. The economy in God's kingdom is doing fantastic today. I'm going to look for a place to sow a seed. Hey, I'm in need, so it's time to sow a seed. Maybe there is a homeless person in this town who could use some extra cash. I'm always a little apprehensive when someone asks me for some money, not because I don't want to help someone, but I certainly don't want to buy someone MD 20/20. At times I feel like that's what I'm doing. Let's see who God brings across my path. OK, I need to let you go for now because the commercial said that you can't just have goals, you have to have plans. I have no plan for today. So I need to stop typing and plan. Talk to you later. I'm just sitting here at the Greyhound Bus Station in downtown Houston. What a fascinating cross-section of America. If those candidates for president want to do something unique and show they are in step with the citizens of this great country, they should bring some media folks along and take a bus ride for a couple thousand miles or so. I'm not talking about their bus. I'm talking about one of these powerful machines. I'm heading out to L.A., a great American city that I'm sure is eagerly awaiting my arrival. Give me a couple days, folks, I'm doing it by bus. Have you ever taken the bus? You've got to try this. I feel like this is a part of American life I have been denied to this point. The bus to New Orleans was running a bit behind, but it looks like it just pulled up. That's a big group of people and its tough to see them go. My only complaint at this point is that the soda machine is out of diet Coke, so I'm having to drink a regular Coke. Have you ever drank a regular Coke after switching to diet Coke for a few years. Don't try it. I doubt I'll finish it. We're watching the Situation Room here in the bus station, waiting to board. From what I gather from their discussion, there seems to be something wrong with the economy. I'll have to pay closer attention and I'll get back to you with the details. I don't worry about the economy very much. My Heavenly Father owns the cattle on a thousand hills, and I have money for a bus ticket. These are the best of times. In times of famine, we enjoy plenty. I think I read that somewhere. I'm just crazy enough to believe it. I better. With the amount of money I'm taking with me on this trip, I'd say the likelihood of me sleeping outdoors within a couple weeks is hovering at around 100 percent. Exciting! You want to talk about walking by faith? I hear a lot of folks talk about it, but I have the distinct pleasure of being able to do it! A new hallelujah!! I'm sure I'll find work. You can shower at YMCAs, right? While I'm waiting to move into whatever place God has for me there, I can get online at the library with Ted. I may seriously try to find him. I'm sure everything will be fine. I'm doing the right thing, right? I'm walking in love. I'm letting go of all the past offenses and pressing forward to my new beginning! What an amazing feeling. Houston, you are a fantastic city. The city of my birth. The city of my rebirth. And the city of an unbelievable Greyhound bus station. The battery needs to be recharged on this computer -- let me take a little break from all this difficult typing and try to find a place to recharge. I need to give one of these kind attendants my luggage and get ready to board. Chat with you later on the journey. Liz over at KSBJ doesn't realize what a powerful tool she is in the hands of our God. I was on the Internet machine just a few minutes ago looking at bus ticket prices for Los Angeles (my new home someday soon I hope), wondering if I should get on board. Liz, right after playing East to West (ironically the direction I'm looking), said that we all needed to get on board! Praise God! Confirmation. Powerful. Amazing. That KSBJ crew is out of this world with their sensitivity to God's Holy Spirit. I'm on board! I'm going East to West!!! YES!!! She said "I'm sorry if that sounded bossy." Don't apologize. You put my rear end where it belongs...on that bus. Going east to west. Never, ever apologize for doing what God asks you to do, Liz. She followed that powerful display of God's direction by playing the new Michael W. Smith song, A New Hallelujah. Oh my goodness that's weird! It's a new hallelujah. She pointed out that the song was recorded here in Houston...ironically the place I'm getting on board to go east to west. Friends, this is amazing. It's a new hallelujah! I'm on board a bus to California!! You tell that silly weather guy Anthony that Houstonians are looking at several days of beautiful weather around here...with very, very low humidity. A fine looking day it is outside. Perfect weather tomorrow while we're listening to the morning show with Mike and Susan. Heck, I might be to Fort Stockton by then. "Accept our praise, O Lord, for all Your glorious power. We will write songs to celebrate Your mighty acts!" (Psalm 21:13). I'm just sitting around quietly praising today. Not being really loud. Just quietly praising. It's sort of like putting a silencer on my gun of praise, so to speak. I heard a minister use that terminology recently and I really liked that. It made me giggle. What are you doing today? Praising? Making good choices? Choosing happiness? Here's my new song I've written to celebrate His mighty acts. It's called, "Put a Silencer on Your Gun of Praise." Is the devil in your life not behaving right? Not too bad. I just came up with that in a few minutes sitting here. Israel you can use that without any royalties or anything like that. That would be great on the next Lakewood CD. Don't look now but KSBJ is queuing up "Undo" this very moment. And I'm changing the station. I really do need to change what I've been listening to. Have any of you ordered your Personal Fart Package yet? I really need a miracle and I'm starting to think this might be exactly what I need. Please see this video for more information. If anyone has already ordered it an had good results, please let me know. I'd go ahead and call and get mine today but I want to know it works before I get on this guy's mailing list. You know how annoying it can be when one of these folks starts sending you mail all the time. I was saddened to hear of the passing of Dr. Michael E. DeBakey last night. As someone who has worked at both Baylor College of Medicine and the Methodist Hospital, I can tell you that I've never known a figure in my lifetime that was more revered in a workplace. He really was loved. At both institutions, there was a level of respect and admiration not only for the incredible history he brought to those places and the Texas Medical Center, but also the fact that well, well into his 90s he was still coming to work and contributing whenever needed. 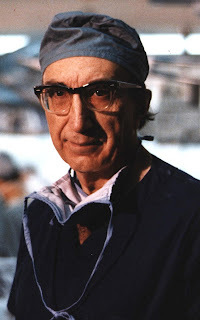 I've been around famous people before, but I was never as nervous as I was when I was around Dr. DeBakey. You realized you were in the presence of greatness, someone who had literally saved the lives of so many people around the world by his contributions to medicine. Some said he could be tough at times. I never saw that. Every time I was around him and saw him interact with others, he was gracious, kind and humble. Once I remember I was working in the PR office at Baylor, when I got a call from NPR, requesting an on-air interview with him. They offered to send him a limousine, and he turned it down. Through his sister, Lois, he instead asked if he could ride over to the radio station with me in my car. I remember being petrified wondering how I was going to maintain a conversation for that long with someone so legendary, but was relieved to find a man who loved to talk about Houston and how he had literally watched the city and the medical center grow up over the years. I never got to see him in the OR. I was usually ushering a member of the press up to his office for an interview when I spent time with him, but it was always a distinct and special pleasure to be able to work with on the occasions I did. My thoughts and prayers are with his family today. Have you ever wanted to wake Jesus up? I mean, just yell and scream and end his nap? My mind is drawn to the story in Mark 4, when the disciples are in the boat and a furious storm ensues. They are being tossed and turned by the violent sea, water flying into the small vessel. And where is God? He's asleep on a comfy cushion, of course. "Jesus!! We are going to die a miserable death!" "We will surely perish when these huge waves cover us!" You know, it's easy for us to marvel at their lack of faith when we are reading the story safe and dry on the shore. However, it can be much more difficult not to give in to the temptation to wake him ourselves when our faith is being tested. Can I get a better "amen?" We can learn a lot from this story. It's interesting that Jesus seems more disappointed by a lack of trust than anything else. Throughout the gospels, Christ continually makes remarks like, "Do you still have no faith?" or "Don't be afraid. Just believe." He is not pleased with doubt. He is not pleased with fear. Fear indicates a lack of trust, and Jesus is obviously offended by a lack of trust. Faith moves God. There is nothing wrong with trusting your Heavenly Father to do exactly what his word says he will do. We all know the storms in life will come, don't we? The Word teaches us that the rain falls on the just and the unjust. If you're not in a storm right now, you've either just come out of one or look out, your heading straight into one. I'm in one right now, and I'm actually starting to enjoy it. The storms are important. They teach us to trust. They teach us to take God at his word. The thing to keep in mind is that we shouldn't be swayed by circumstances, no matter how uncomfortable or daunting they may seem. He's going to work everything out for your good. He may use a storm to push you into doing something he's asked you to do for Him. Wouldn't that be exciting. Stay calm and know God is God. I think I've heard someone say it like this: "It's okay to find yourself inside a storm, just make sure the storm doesn't get inside of you." I like that. You may think he's asleep, but he is very aware of what you are going through. Maintain your faith, find promises in his word that apply to you and your situation, and speak directly to the wind and the waves in all the authority God has given to you as a believer. Let God, the enemy and yourself hear those words coming out of your mouth! Remember, faith comes by hearing, and hearing by the word of God (Rom. 10:17). All the faith you need to conquer your circumstances is in his word. Let me ask you a question today: What wave has got your eyes off Jesus? Don't look at the waves! 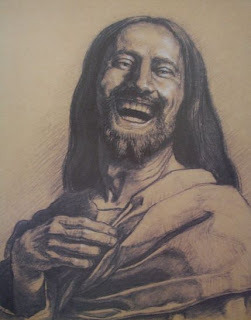 Look at the funny picture of Jesus laughing if you have to. Come on, rest. Let Jesus take his nap. Remember, no matter what adversity we face today, the son of the Living God is still on our boat. Today wouldn't be complete without sending out a special "thank you" to Franscisca Kruissink, owner and operator of the Dutch Web site, Hit2Hit.com. As you probably know, increasing readership of this blog, all over planet Earth, is important for a number of reasons. One of which is we want everyone to know the fantastic things God is doing (and will continue to do) here in the United States. Franscisca recently awarded me 15,000 free visitors to my site, insuring that more and more and more wonderful people will look at my blog. A good woman with a good heart. And deserving of our "thanks." Hit2Hit is an online community and advertising portal that provides traffic worldwide for Web site owners, either free or at a very low cost. I use a YouTube video as an outlet to promote this blog, and I say with a great deal of humility today, that it is working pleasantly well to bring readers. (This is despite the fact that I am convinced that the YouTube hit counters don't work. That video is getting two to three times the visits than actually show on the counter, and I have the stats to prove it. Since 12:01 a.m. I have personally sent more than 1,200 unique visitors to that page. Where are they at, YouTube?). If you have a business, Web site, church, ministry, radio station or rock bank, and you'd like to brand yourself for free worldwide, click right here and get started today. And again, thank you, Franscisca and Hit2Hit, for being a true warrior overseas in our mission to get the word out about all the great things happening here in the United States. May God continue to bless your business and Web endeavors. 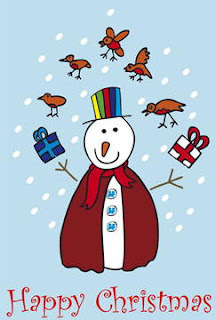 Blogger's note: I love to thank people publically for doing the right thing. It's a passion of mine. If you have an online community, a traffic exchange, or any other ad portal and would like to get a free plug and thanks here, simply follow Franscisca's lead. 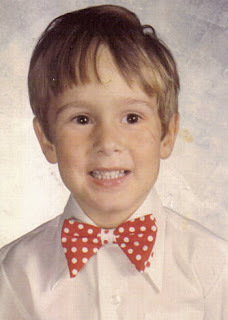 My mom always made sure I had cute haircuts as a kid, but I'm not convinced that letting your five-year old go to school on picture day wearing a polka dotted bow tie is really a good idea. I look like a young Heber Taylor. Not that there's anything wrong with Heber's bow ties, I'm just not sure five- and six-year olds quite understand the fashion statement. With the wrong classmates, it could have been catastrophic. Alas, I survived it to share that photo with you all today. Are we all resting today in God's sufficiency? That's what I like to hear. "'Not by might nor power, but by my Spirit,' says the Lord Almighty." (Zech. 4:6). If you're anything like me, there is a tendency when things get hectic or I'm in the middle of a battle to forget that I am resting in God's strength and sufficiency alone. We get tempted to do things in our own strength, and when we carry that out we often don't see God's intended outcomes for our life in any situation. I read that familiar scripture today and it reminded me of His incredible strength and ability, and our lack of it when we rely on our human limitations. Anything worthwhile is accomplished soley through the spirit of God operating within us and around us, and we can rest today knowing that He is at work in our lives -- leveling the mountains and making our crooked places straight before us. I would encouage each of you who read this today to be consistent in the daily disciplines that allow you to see God's power and strength in your life. Read your Bible. Keep your mind renewed. Don't neglect your prayer time and those moments of the day specifically set aside for hearing His voice and following after His direction. God does want to do great things in and through our lives, but it truly is not by might or power, but by His Spirit. Part of this is just resting in Him, and surrendering our will completely to Him. The picture that some have used to describe this would be a baby resting in the arms of its mother. Lately, that's the way I've had to imagine it. When my thoughts try to return to worry or the struggle, I simply have to picture myself resting in His arms like a baby, knowing that He is supremely concerned with my life and my needs, knowing that He is truly working all things out for good and that His ways are higher than ours. Even in those times when we when we don't understand everything going on around us, we can rest knowing it's all in His plan and He will ultimately get glory out of our particular situations and lives. So today you can rest. Know that no matter what you're facing, God is for you and nothing can throw off the great plan He has for your life (Prov. 21:30). When we realize that we can do nothing apart from His love and power operating in our lives, it's actually very freeing. And it's the 4th of July, so let's be free. We don't have to worry or struggle, but we can know that His power is made perfect in whatever weakness we may have and we can rest in the knowledge that He's at work getting everything prepared in our lives. I'm not sure what's going on here in Houston, but it doesn't matter anymore. I want you to know I care about you...and I do think about you often. I'm sorry that circumstances in my life have postponed us getting together before this, but if you hang in there a little longer, I'm doing what I can to get some resources together to get where you are. The intensity of the war against me here is amazing, and I want you to know that I truly believe as I write this tonight that the answer is for me to move. Basically, here's why this is happening. I have found myself right in the middle of a situation that is incredibly political, and there are people who benefit from propagating an idea that I'm not sold-out to God. It's a lie from the pit of hell. Now, it's been a journey getting here. It's been hard work, and it took time, but I'm all His. For years. You need to know that. If these people can make others believe that I'm not truly serving Him, or that I'm wishy washy, or I'm living with one foot in the world, it forwards their cause. Unfortunately, their cause is, and has always been, built on lies and untruths. I'm just like you, sweetheart. Working this salvation out with fear and trembling. And what God has done in me is amazing, and I submit to you that is exactly why I'm going through the war I'm going through. The enemy preferred having a hold on me. He doesn't have that anymore, and he's furious. I'm closer to God today than I ever have been, and I've got a piece of news for everyone: I believe God is proud of me today. I am moving. Moving, however, takes resources. I will get there, and I believe wholeheartedly that with that act of obedience a door will open for me there as well professionally. You are undoubtedly waiting for a man of God who is serious about his walk with God. I promise you that you have nothing to worry about in that department. I am dedicated to Him and walking after Him. Any voice that tells you (or insinuates) that I'm not, is not speaking by the spirit of God. I have sat here all this time waiting primary because of some prophetic words that I obviously misinterpreted. When coupled with scriptures in God's word that promise victory, I have believed something was going to happen here that for whatever reason seems more and more unlikely the closer I draw to God. It's bizarre. Sometimes, it seems, the victory God presents to us comes not how we believe it is going to come. I'm not crazy enough to argue with God about what is best for me. I'm just thankful he has a plan and it includes you. I have nothing but the best thoughts about you, and nothing but the deepest respect for you. You are beautiful and prefect just how you are! Don't ever believe anything different, no matter what anyone tries to make you believe. Always, and I mean always, consider the source. Ask yourself: Do they have an agenda? I'll be wherever you are as soon as I can get there. He may still be the same good ol', down to Earth guy that in many ways defies what normally comes to mind when we think of professional athletes, but Lance Berkman is changing. He may still wear boots, and not cuss or drink, and he may still have his problems with them "dad-gum liberals." He may even say he's not changing, but press him a little harder, Richard. Ask him if he's truly the same man he was five or ten years ago. Lance Berkman is changing, and I am one fan (and there are many others) that is excited to see it happening. "And we, who with unveiled faces all reflect the Lord's glory, are being transformed into his likeness with ever-increasing glory, which comes from the Lord, who is the Spirit" (2 Corinthians 3:18). From glory to glory, year after year, this man is changing. That's one of the reasons I like him so much. He's becoming more and more like his Lord. Being transformed, as the Bible says, into the image of the man who 2000 years ago gave his life for Lance (and Richard and John). Lance is one of the King's kids. Lance, why you ate those Twinkies at Wrigley Field I'll never know. Would you eat a hot dog at Minute Maid Park if a fan threw one on the field? I'd like to think you'd do the same in Houston, but who knows. He's changing, and that's why he's the powerful role model he is. In my opinion, that's one of the reasons he's such a fantastic baseball player. Everything he puts his hands to, ultimately, is going to succeed and prosper. That's why he's made it a point in the past to meet with local young men in the organization he heads, that I've seen featured in the Houston Chronicle. He's changing, and he wants youngsters that look up to him to know that through God's power they can change to. Thank you, Lance. Thank you for changing, and being committed to that process. Thank you for being an example not only for people in this town, but all over the league. Keep changing, brother. We need more like you. Bloggers note: If I was the editor of a faith-based publication or television program looking for great story ideas, I'd certainly look into doing one on the transformation of Lance Berkman, one of the best players in Major League Baseball today and a powerful testimony of God's changing power. You'd seriously never been to Wrigley Field before? You can put this one in the "truly amazing" file. The girls of BarlowGirl, who grew up in the city of Chicago, Illinois, didn't get out to Wrigley Field to catch a Cubs game until they were in their mid- to late-20s. Isn't Wrigley Field a staple of Chicago life? It would be for me if I lived there. That is a gem in your community, and you should cherish it. Anyway, great to see you girls finally got out there. What did I tell you about baseball? I thought I'd drop a note today to honor you, my readers, and let you know how much I love you. Pastor Joel says I should recognize the greatness of the people God has put in my life. If I had a spouse today, she'd be the best! If I had kids, they'd be the envy of everyone around. Some of my friends and family are having a difficult time (or so it seems) with my present set of circumstances, so they are often honored and loved greatly from a distance. I believe this is with God's approval, I might add. This has been a good season for me to wait on the Lord, mostly by myself. However, if anyone in my life doesn't feel honored, it would always be my hope and prayer that you would let me know so I could correct it quickly. I honor and respect you so much, dear reader, that I thought I'd let you know that the posts of the last month or so are very real. I wasn't kidding, or trying to be silly. Was some of it a little hard to swallow? Well, hard to swallow or not, it's true. From where I'm sitting, this is a serious situation, and I will wait until I hear from someone I trust to tell me that it isn't a serious situation anymore before moving on. Lord willing, Los Angeles is the eventual destination, in case you are wondering (unless, of course, an opportunity opens up somewhere else that I feel the Lord wants me to take). Got a job offer for me? This would be a great time to let me know. I really like the prayer section of Pastor Joel's devotional today. "Show me how to love others the way You love me so that faith will grow stronger in my heart." You know, quite honestly, as I examine myself today, I don't think love or faith are my problems. Joseph didn't have a love or faith problem either, and he still sat in a pit. Paul didn't have a love or faith problem, and he sat in prison. In that desert, Moses didn't have a love or faith problem; his problem was the people God had put in his life (I wonder how easy it was to honor them while they grumbled and wandered around in the wilderness). David didn't have a love or faith problem, but when you read the Psalms he sure seemed like he wanted some people to fry. I think when things seemingly don't go our way in life, we tend to look for a reason. Unconfessed sin. A bad attitude. Not honoring people. A lack of faith. Not showing the love we should. Of course, we can always improve in any of these areas, but I think there are times we are in a situation for one reason only, and Pastor Joel mentions it: building character. During a quiet time the other day, I asked God this very question. Is there something I'm not doing that I should be doing? I promise you, I'll do it. I asked Him, Lord, what do you want me to do? Almost instantly, this dropped into my spirit: "I want you to trust me." Doesn't sound too complicated, does it? Many are the afflictions of the righteous, the Word says, but the Lord delivers us from them all. In that scripture, it doesn't sound like that's up for negotiation or argument. He's asking us for trust in His word, which never fails. Here's something important for us all to remember: I didn't wait all this time for God's hand of healing and deliverance to be turned away without it. I will stand until this thing is resolved. Again, if you're in my life and don't feel loved or honored, let's fix it. Drop me an email, and I promise with humility and repentance I'll make it right. You all should check out my friend Rebecca St. James' Web site from time to time. Man, I want to honor her. She often has something encouraging to say about life in God. She's apparently re-releasing her book, "Wait for Me," in the near future. Is everyone else asking the same question I'm asking? How in the world is this girl still single? Here is a committed, consistent, successful, bright, beautiful, romantic woman of God. Are all the single men around her completely lost? Either that, or their standards are way to high. I guess we could chalk it up to everything else in the kingdom...it's a timing issue. I like what she said about God's people using their creative skills. I agree with her. We serve a creative God. Just read the first sentence of the Bible. I believe God wants (and plans) to move mightily in the arts, bringing true believers into the arena of the arts and film like we've never seen before. After reading the 5/1/08 entry on her site, my main thought on this is that sometimes the problem isn't vision or desire, it's provision and open doors. You see, I'm not a coasting type of guy. No one likes coasting. However, one of the many things God has taught me over the past few years is that no matter how hard my head is, I cannot break open a door with it if God has chosen to keep the door shut right now. I have a great sense that God wants to move in the arts/film in a big way, and I would be honored and privileged to have any part in that move that I could. But quite simply, we never know at the outset if we are just one of the many voices to help prepare the way or if we are ones that He will ultimately use. In many ways Rebecca has always been a trailblazer, and I'm sure God will keep her on that path. I look forward to seeing the many ways God will continue to use her creative talents and gifts in the future. I'm not silly enough to believe Rebecca reads this blog, but if someone who knows her does, I hope they will encourage her to keep praying for this mighty move of God in the arts, and to fan the gift He's put within her. I like how she stated that we should we should link arms and walk together into our creative destiny. Did I ever tell you about the dream I had? Check out my blog post from January 30, 2006. I actually went on that journey I mention there. What I didn't tell you is that I had bought a ticket to opening night of the Rebecca St. James "If I Had One Chance to Tell You Something" tour, somewhere in Mississippi, I think. My plan was to drive to Mississippi, catch the show and then go camping for a few days by myself to get alone with the Lord. Why would I drive to Mississippi to catch a Rebecca St. James show? Well, at the time I thought I was going to marry her, and that's how you honor the person you believe is your spouse, right? You show up, unannounced, at the opening date of her tour several states away and smile at her from the audience. Well, that will either get you engaged or you may have to put up with a inconvenient restraining order. Luckily for all of us, I was in my office at the legendary Methodist Hospital in Houston about to run out to go home and pack, when the phone rang. I picked up the phone and was told by iTickets that the show in Mississippi had been canceled. However, I still had asked for several days off from work, so I decided to go ahead and go camping at a Texas state park. I got out there and nothing went right. There was a burn ban, so I couldn't start a fire. And it was cold out there! Lord, speak to me. I broke out my Bible and a flashlight, determined to hear from God. I remember thinking, I drove all the way out here to hear from you and I'm cold, it's dark, and the concert got canceled. Then I fell asleep in the tent. I had a dream I was backstage at an event. I think it was a concert. I was talking to a group of people and I noticed that Rebecca St. James was across the room from me. We made eye contact, and as she moved around the room we kept making eye contact. She walked passed me at one point, and I stopped her. "Sorry to stare," I said. "You're just the rock star I've been wanting to meet." She laughed. "Oh, it's because I'm a rock star, huh? And all this time I've thought it was because of my mind." I'm not sure what she meant by that. It's a dream. It's not supposed to make perfect sense. But that's what she said. We both laughed. "Let's get out of here and go talk about it," I said. We put our arms around each other and walked out of the building together arm in arm. Who knows, maybe we were walking out of that building into the creative destiny God has called us to? Listen girl, if that's a script you're reading in this photograph, please have your people Xerox it and mark the part I'm supposed to read for. I'm like you. I'm not a coasting kind of guy. By the way, how was your parking experience at Lakewood last weekend? I know there were probably some clowns out there with stop watches Sunday to see if I had made that up or exaggerated, but I assure you I did neither. That's where I started parking shortly after the move to the former Compaq Center. When you drive nearly 45 minutes both ways to church, you find yourself trying to get creative in the parking garage. Hey, maybe that's part of my creative destiny. No one should be angry about that post. Pastor Joel always said the favor of God includes good parking spots. Amen.